In the meantime, I’ve got to find some other movies to put into my normal Harry Potter rotation slot. There are other epic tales to adventure to be watched. 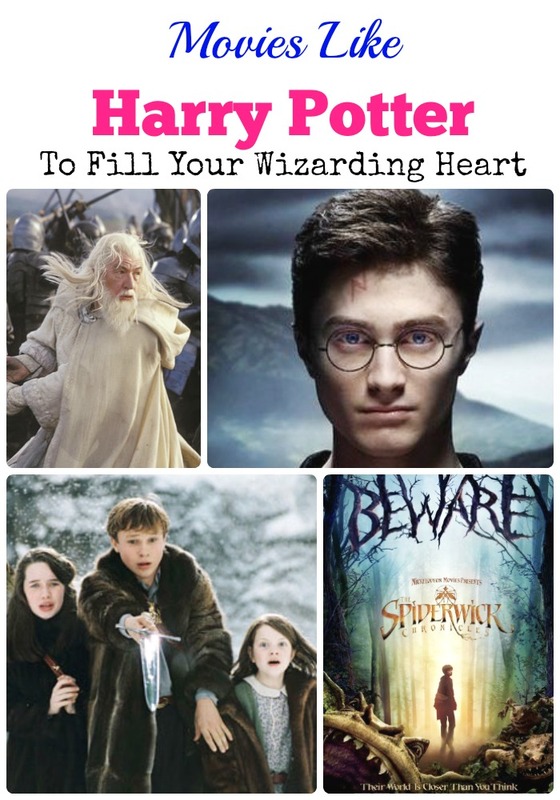 If you two need to wipe away your tears with a new movie, or just want to change up your movie night, check out my picks for movies like Harry Potter that will help you through! The Chronicles of Narnia is a series of 3 fantasy movies: The 2005 The Lion, the Witch and the Wardrobe, the 2008 Prince Caspian and the 2010 The Voyage of the Dawn Treader. The movies are based on children and their adventures in the Narnia world. Narnia is headed by a wise and powerful lion named Asian. The film series features the voices of Liam Neeson as Asian, Georgie Henley as Lucy Pevensie, Skandar Keynes as Edmund Pevensie, William Moseley as Peter Pevensie and Anna Popplewell as Susan Pevensie. The Lord of the Rings is a trilogy of high fantasy adventure movies: the 2001 The Fellowship of the Ring, the 2002 The Two Towers and the 2003 The Return of the King. The movies are based on the character of Frodo Baggins, a hobbit, who embarks on a journey, allow with a Fellowship, to destroy the One Ring. The movies stars Elijah Wood as Frodo Baggins, along with Sean Astin, Christopher Lee, Orlando Bloom, Liv Tyler, Ian McKellen, Viggo Mortensen, Billy Boyd and Dominic Monaghan. The Spiderwick Chronicles is a 2008 fantasy adventure movie. The movie follows the adventures of Jared Grace, along with his family, as they discover the world of magical creatures including trolls, goblins, and faeries. The movie stars Freddie Highmore as Jared/Simon, Mary-Louis Parker, Joan Plowright, Sarah Bolger and David Strathairn. The Secret Garden is a 1993 drama fantasy movie starring Maggie Smith, Kate Maberly, Andrew Knott, Heydon Prowse and John Lynch. The movie revolves on Mary Lennox, a young girl who is sent to live with her uncle after the death of her parents. Discovering her uncle doesn’t pay much attention to her, Mary sets out to explore his estate, and discovers a garden filled with secrets. Why hello there McGonagall, so we see your earlier works! Are there any other movies like Harry Potter that you know I should watch? Tell me all your favorite epic adventure stories in the comments!